The 72 inch Model T3244 Rough cut mower I bought with my Power-Trac PT-1845 tractor has been an effective mower but it has a few design weaknesses I've improved upon over the years. Here's what I've done to improve it. The PT1845 has a draft control or weight transfer system on the lift arms to transfer the weight of the mower to the front wheels. This is necessary to gain the traction needed for slope mowing. The system takes high pressure from the tram pump and passes it through a pressure reducing valve (adjustable to attachment weight ) then through a four way - two position solenoid valve to turn the draft control on and off. The solenoid blocks flow until energized, then sends adjusted pressure to the bottom of the lift cylinders and opens the top of the cylinders to the tank. This allows the arms to act like a giant spring lifting on the attachment and thus transfering its weight to the front wheels. Long ago I gave up on the soft low lift blades Power-Trac sells for this mower and now make my own from Bush Hog #82323 blades. I buy 3 of these ($11.91 each at Columbia Tractor - I think they'll do mail order if you are interested in a set and can't find them locally). 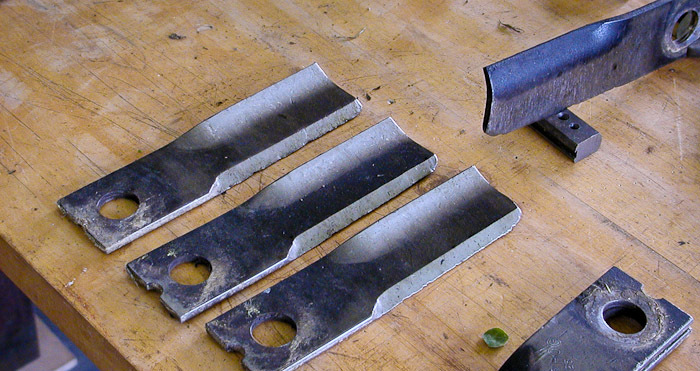 These blades are hardened so I soften them up with a propane torch directed at the spot where the holes go then drill a 1 inch hole 7-1/4 inches from each end and finally cut them in half with a chopsaw. It take me about an hour to make them up. The first year I chewed up two sets of Power-Trac blades. The first set of these hardened Bush Hog blades lasted two years and now I'm on my second set. 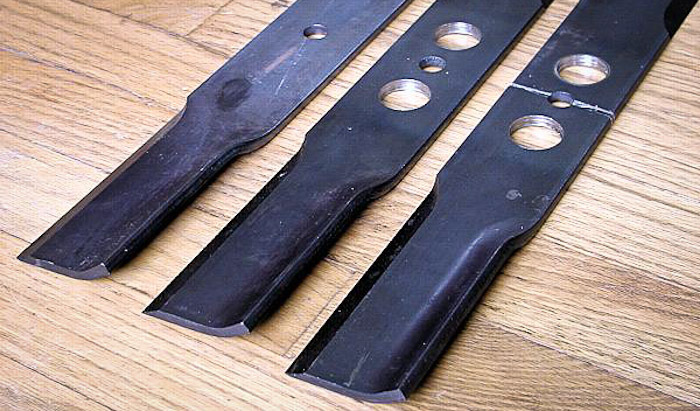 These blades last quite a while - here's the set I made earlier with some hours on them. 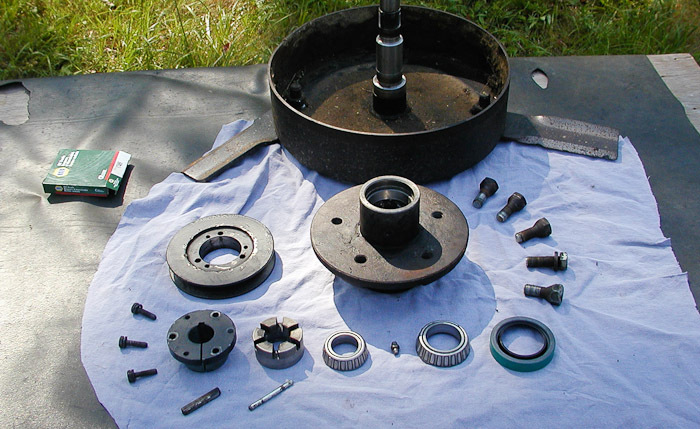 [8/30/07] I took this spindle apart thinking I had a bearing failure (there was a lot of axial play in the spindle). There is probably 500 - 600 pretty tough hours on the mower and I really expected trouble but everything was fine. I cleaned it all up, put in some new grease and a new seal (backwards I realized later! ), adjusted the play out and called it good. Several times now I've found a whole spindle assembly flopping around on loose mounting bolts. Power-Trac in it's infinite wisdom mounted these spindles with tapered lug nuts in straight drilled holes so I could get that sinking bearing-gone-bad feeling on a regular basis. 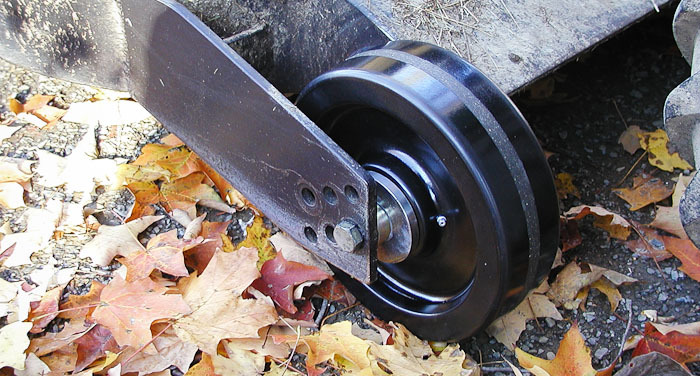 I bought a pair of Albion Texite 10x3x1 2600lb rated industrial caster wheels from MSC, part number 00995878 @ $36.24ea. Since the PT setup uses a 5/8 bolt as an axle and these new wheels run a roller bearing on a 1 inch axle I made a bushing from some 4130 stock I had left over from making blade bushings last year. Then I made large flat thrust washers and smaller spacers which I JB Welded together to make handling easier. Voila! 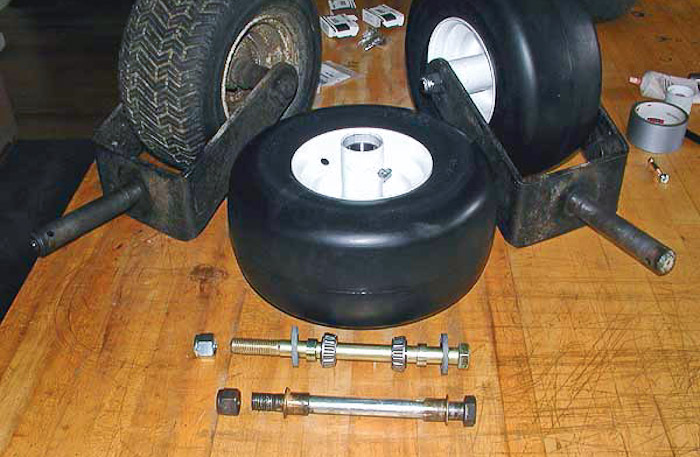 Note the easy grease fitting access; a problem with the OEM handcart wheels when mounted in a forward height adjustment hole. The sleeve bushings I bought I used to cut four 7/16in long spacers. These form a surface for the oil seals to ride on and project 1/16in beyond the wheel hub so the hub doesn't rub on the caster yoke. 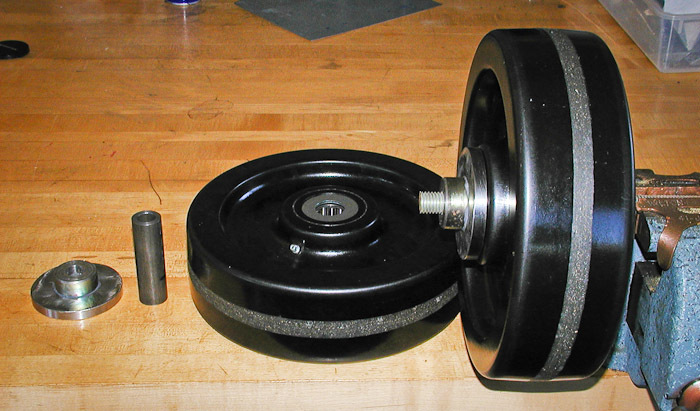 The caster yokes as built by Power-Trac have 7 inches between the arms. A few carefully applied whacks of a 10lb sledge spread them to 7-1/4 for the new hubs. The 3/4 x 10 bolts are a little long (to get a long enough unthreaded portion for the axle) and were later cut to just accomodate the nylon lock nuts.